Back in January 2016, I re-read Matilda because I had tickets to see Matilda the Musical at the beautiful Orpheum Theater. I wanted the story to be fresh in my mind because I love comparing the books to the movies, or in this case, the play. I really enjoyed the play. It's hard to review because... it's amazing. I would have gone to see it again the next night if I could have! The stage looks fantastic with all the letters and colors and blocks, and it pulls you right into Matilda's world. The actors are perfect in their roles. We saw a native Memphian play Matilda on opening night, so that was a nice perk! The next day, I watched the movie. I remember seeing the movie as a child, but it's just as good as an adult! 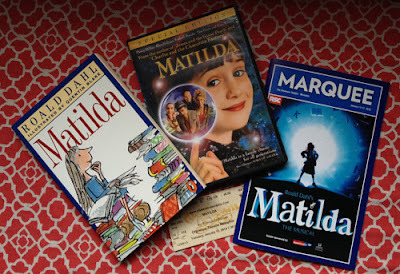 The movie differs a little in that there are some added scenes involving Matilda, Miss Honey, and Trunchbull, but this storyline fits in with the overall story, and isn't a major discrepancy like some plot changes are in movies. The musical differs quite a bit in that Matilda's mother has a different hobby, which doesn't add much to the story, in my opinion. Matilda also tells an ongoing story she's made up, which is overly sentimental and also doesn't add much to the story, especially since Miss Honey's backstory is explained so concisely in the book. But I am a huge Tim Minchin fan, so I appreciate how these divergent storylines help develop the musical side of the story. Tim Minchin's songs are very clever and add jokes and wit to the story. I think the movie and musical are both so good because they stay pretty close to the original story. I'm usually not a big fan of books that are made into movies; I'm in the camp that the book is always better than the movie. One exception is To Kill a Mockingbird, which is an amazing film that really does the book justice. Now that my memory has been refreshed, I'm adding Matilda to that list. And though the musical strays from the original story, I highly recommend seeing it if you get the chance! Matilda is coming to Playhouse on the Square for the 2019 season, and I'm so excited to see it in a smaller playhouse! It was fantastic at the Orpheum, but I was ready to see it again the next night, so I know it will be a blast to see it at my favorite venue.